So it is Ramadan again. The fasting month in the Middle East [and for all Muslims around the world]. For me it is vacation time - who wants to be working, when alcohol is even more restricted and most sane Westerners are staying - well where they are? Ramadan from a beverage perspective though, can be interesting! This is a brew made out of tamarind. It is very different - has an unappealing muddy brown color [usually also not completely clear] - but it is somewhat very refreshing and I would even say delicious. Guess what - it seems, that this drink gave "bartender's darling" the Julep its name. It features grape molasses and rose water - very sweet [like all Ramadan juices, there is usually a ton of sugar in it] - exotic - nice. 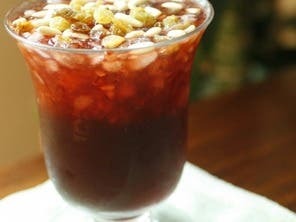 A rather thick drink, made from dried apricots or more often apricot fruit leather, water and sugar. I have experimented already several times with these drinks and they are awesome. These are just flavors, which are not commonly found in commercial products. Truth has to be said - unfortunately pretty much nobody makes these drinks from scratch - either way the big companies, which are offering also fresh squeezed juices are selling the drinks conveniently - or [worse] there are Arabic syrups in which you just need to add water, to achieve these drinks [usually wrongly labelled as "Ramadan juices"]. Unfortunately the syrups are featuring artificial aromas [I don't know why], preservatives and other stuff, which I am not so fond off. 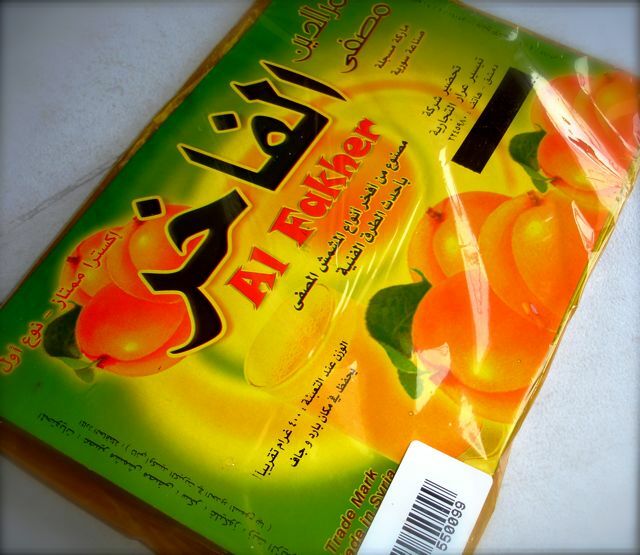 Anyway - the fruit leather seems to be popular as well - especially for families which are doing their Ramadan shopping. And guess what - I bought also this apricot leather. truth has to be told: I actually bought it, because I thought that it would be an amazing idea, to stuff a turkey roast with apricot - but how much do you need for one small breast? I actually have quite a lot of semi-crazy things laying around in my home, which just wait, to be utilized. And this apparently lead to the Pekan smoked Qamar Al-Deen Habanero soda [I know it is long...]. Add a piece of apricot fruit leather into a blender [I used a canning jar and my awesome bamix immersion blender]. Add hot water and blend [be super carefully - hot water in a normal blender often creates an "exploding" blender cup - not only it is dangerous because of the temperature - but it makes also a huge mess - slowly pulse it until hitting it with the full speed]. Add some habanero powder [how hot do you like it? ], a bit of liquid smoke and a load of sugar. Add 1% citric acid of the weight of sugar and blend until the sugar and the citric acid is dissolved. Use this as syrup to flavor club soda - or add it to your favorite carbonation device, add water and carbonate it! Citric Acid: Yes - you could also use other acids [malic acid, acid phosphate, lactart - and why don't you go to Darcy's artofdrink.com website - he has a shop, where he sells this stuff!] - but citric acid is almost everywhere available [aka lemon salt] - so I go for this. I make also liquid citric acid [1:1 citric acid to water] - but I like to use this to adjust recipes - as it is much easier to blend in afterwards - for drinks, which are prepped before, I usually go for citric acid in crystal form. Habanero Powder: You don't want to have only spicy - you want to taste the varietal of chile. I guess Piment d'Espelette or other fine chile powders will be also fine. As my habanero powder is fermented, it is slightly salty and developed through the lacto-fermentation a ton of aromas. It is not only spicy [but still, you want only to add a knife-tip worth of powder - it is definitely devilish hot]. It is an acquired taste - but totally awesome. Due to the fact that you a diluting the apricot quite a lot, it is more refreshing and not as heavy as your usual apricot nectar. The habanero gives an almost floral but definitely hot "sting" and the smoke is bringing it all home. It is weird and wonderful. You could definitely add some orange to the mix - but I think, it is fine like that. And you could filtrate it, so it becomes clearer [and carbonates better] - this is work in progress - I have bought finally a Buechner funnel filtration system [my mixed review will come later] - but my adventures with this method will come in a later post. Now - it is Ramadan - not that I made any good resolutions of not drinking any alcohol - but out of respect, I don't want to get too much into the booze frenzy. Do you have any recipes converted from traditional beverages? And are you using chiles in your creations? Please comment below!